The Winos' Wine Guide: Finlandia Vodka, Dirty Martinis, Fly Tying, and a Maltese Puppy...! 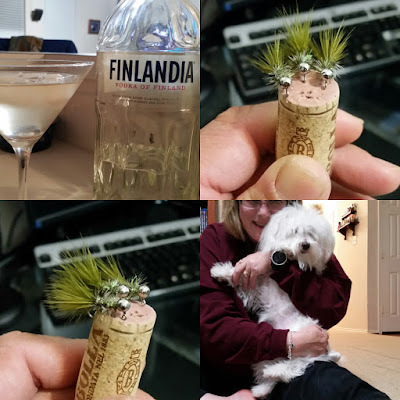 Finlandia Vodka, Dirty Martinis, Fly Tying, and a Maltese Puppy...! Finlandia Vodka, Dirty Martinis, Fly Tying, and a Maltese Puppy.... It doesn't get any better! Was a cold and rainy evening the other day. Decided to chill and have Dirty Martini while tying a few flies in preparation for a fishing trip. Afterwards, always a good time... good feeling, when you hug a cute Maltese Puppy! Legacy Hall for Craft Beer and Foods! Cinerator 91.1 Proof Hot Cinammon Whiskey!